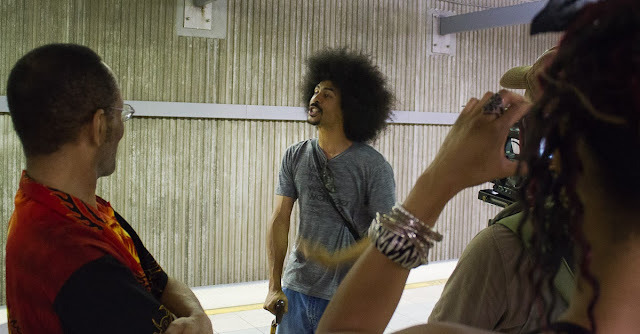 Last week on La Bloga-Tuesday, I featured a group of poets reading their stuff on the Los Angeles subway and Hollywood sidewalk, Poesia Para La Gente: Poetry Underground. The event marked yet another success in Poesia para la gente's commitment to bringing poetry to public spaces. It's the kind of thing that adds vibrancy to a city's cultural life, and it doesn't cost the city a dime. 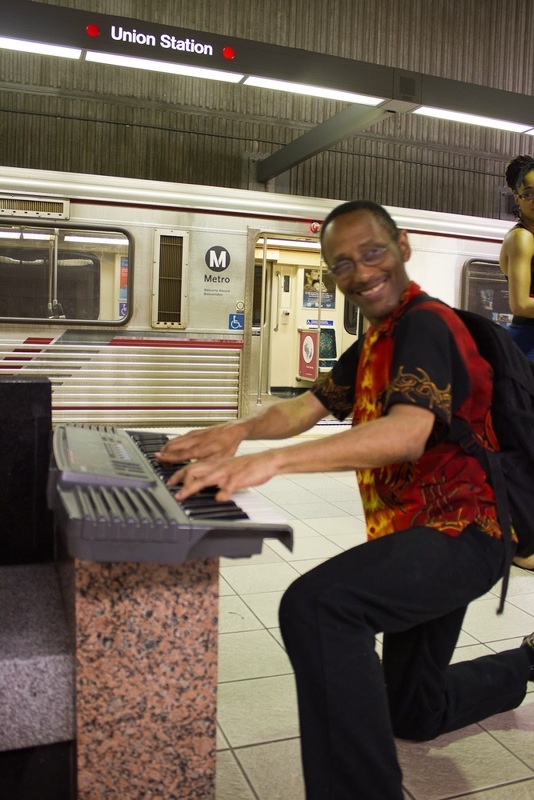 Puro good news is poet Sean Hill's guest columnist sharing a poet's-eye view of the event. And, in a capstone of good news, organizer Jessica Ceballos sends a note from Isabel Hirama, the beatboxer who joined Sean Hill in the MacArthur Park reading. To a poetry event where I knew (1) bubbles would be allowed and (2) just in case of any trouble...I got bubbles. Case in point: baby crying. Sitting across from me as the second round of poetry started. We're sitting on our first subway ride and this child is about to erupt bigger. This is a job for BUBBLES! Disaster immediately averted as she now laughs and screams too loudly in happiness, but the poet was on the far side of the train. I continue to blow bubbles for her happiness until my lungs begin asthmatic actions. Next bubble incident. I decide in the next train it isn't fair if I blow bubbles only on the first train...as soon as the first bubbles land on strangers...one woman slowly ascends from the mass of strangers, floating to me, like said bubbles, and saying..."What...!!! I have bubbles too!" and immediately bubble mates exist. We begin blowing them at each other and at people around us, while exhanging conversation between the enchanting, consistently dissipating bubbles. "I went to a wedding and they had these for all the guests, it was like 3 months ago, I decided to keep them." I let her know, "Sweet, because it would be awkward if there were just other people in the world walking around with bubbles in their pocket." It was time for me to share a poem and I do, her friends I just introduced myself to look in wonder and delight realizing they just became a part of something so alive with all these poets sharing so openly, lovingly, and sincerely with strangers...who now become friends. Steps and steps and more steps later, which are usually easily taken, pretty strenuous at the moment since I have a cane for the time being, torn MCL (whatever that is) in my knee from doing "the Matrix" move in a b-boy-ish battle at a fundraiser for a human right's campaign for the Filipino people. The ligament was a worthy sacrifice. We arrive at MacArthur Park and blow bubbles for 5 or so poets, each poem seemed perfect for bubbles in someway...love, self love, yearning and work towards a better society...which seemed great to me especially today. Friends and fellow artists Ryan Nance and Devereau Chumrau along with Karineh Mahdessian all not only helped with bubbles and the blowing of them into the world...but also carrying my main two bags and sign with the #'s and @'s of as many things I could fit on there to keep the world in contact with us. I don't know what's going to happen next. That's the beauty of being human and being an artist. I tell a quick synopsis of how Isabel Hirama and I met on the train and I intro her as a beatboxing college go'er visiting LA for the first time from outta town. She is welcomed quickly...she smiles widely...I give her the "start when you're ready" look...and BAM. Beatboxing bursts out of her body like a one woman team of acapella artists! Fluidly, crsip, and clean, I freestyle poetically something about infinity, sharing our love and craft, and something about hoping a bird doesn't poop on us. Yes, it all made sense somehow, trust me...it did. Applause and high fives, hugs and "where did she come from's" begin to echo as we had the first open mic'er who was not part of our original crew of craftsmen and women demonstrate their love of what they love to do. I look at things in the big picture alot...and honestly...if everyone joined an open mic for a day out of nowhere: world peace. I aim high. Sometimes I think I'm joking when I say things like that...sometimes I don't. What Jessica Ceballos did was get a bunch of poets together to cannonball with love into the pool we call Los Angeles. What Isabel Hirama did was not only get soaked by the wave we made...but she smiled, wiped the water off her eyes, and dived in to make her own splash. If everyone did what Isabel did...world peace. Isabel Hirama, via Jessica Ceballos sends along this message from Taiwan. Coming across Poesia Para la Gente on my first afternoon in LA completely made my day. 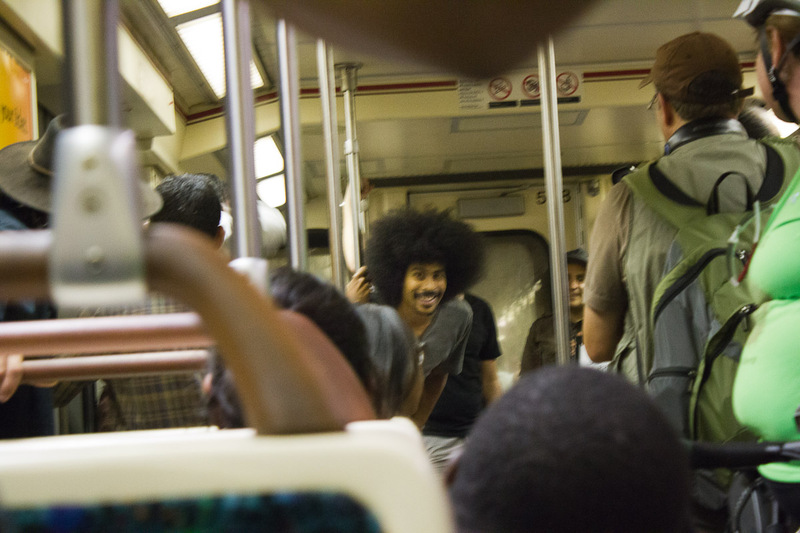 As soon as I noticed the bubbles drifting through the metro car, I knew we had stumbled upon an adventure. My friends and I were mesmerized by their poetry performances and delighted by the way the group welcomed us. 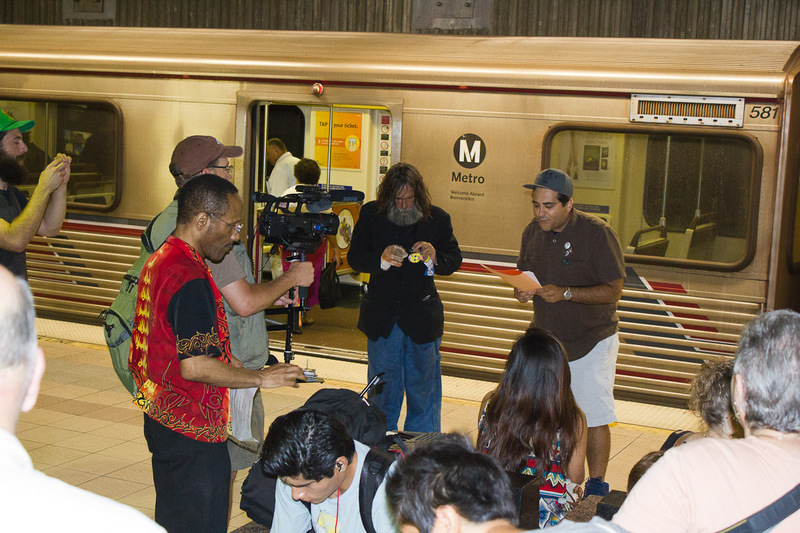 When I left LA I wished #pplg could travel with me and bring a little bit of magic to the sidewalks/subways/parks of cities everywhere! Fell in love with this city - walk me down the aisle! Copyright 2013 Victor Avila. All rights reserved. Victor Avila is an award-winning poet. 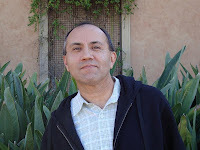 He is also an illustrator whose collection Hollywood Ghost Comix will be published in September of 2013 on Ghoula Press. Victor recently completed a translation of Richard Carradine's book Park After Dark which will be available in early 2014. In my solitude, I discovered the healing nature of silence…In the space of silence I discovered peace with my solitude… Rather than walking blindly through my day, I will seek out the resounding beauty that waits in whisper before me. Today I will embrace the quiet of solitude that I may hear the true sacred song of my heart. in sacred whispers before me. Along with all of us, his primos. Unless we worked the mine. Scattered, no longer in touch. Gabe met and married Debbie. He found his Morenci in San Elizario. Replaced his own Díaz family. Copyright 2013 Elena Díaz Bjorkquist. All rights reserved. This poem is a eulogy for my cousin, Gabe Salas who passed away on June 3rd, 2013. Like Gabe, many of us from Morenci searched for a place that resembled our hometown, a place where we could put down our roots and call home. My website is at http://elenadiazbjorkquist.com/. Independence Day, a day to celebrate and share our amalgamation into the Fondue Pot. Speaking of food, for my contribution to the upcoming gathering, I decided to make Salsa Verde the way my Sweet Mother used to make it. Here is how she made it. Enjoy! Raúl comes from a place south where the sun shines fiercely, where Indigenous and European cultures collided. An avid collector of poetry books proclaimed himself a “thrift store junkie” who occasionally volunteers as a DJ for KBCS 91.3 FM. He conducts workshops on The Day of the Dead. Featured in the program for the 2011 Burning Word Poetry Festival in Leavenworth WA He is also a Translator. His most recent work is the translation of John Burgess’ Punk Poems in his book Graffito and his ardent inaugural collection “All Our Brown-Skinned Angels” published by MoonPath Press out of Kingston WA is filled with poems of cultural identity, familial and personal, a civil protest, personal celebration, completely impassioned. 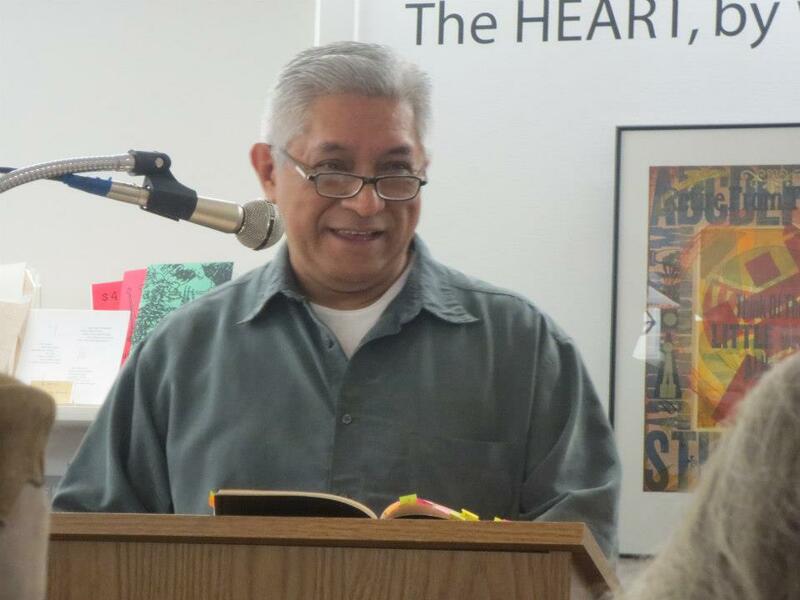 His book has been nominated for the Washington State Book Award in Poetry for 2013.